Sheryl Zacharia was born and raised in the New York area and has lived in Manhattan all her adult life. At Southhampton College, she majored in painting but spent many years pursuing a career as a singer-songwriter. She performed in the NYC club circuit for over 10 years and is a published songwriter. Missing her visual arts roots, she began working in clay which started her on a new artistic path. She studied and worked in various potteries and has exhibited both locally and nationally. 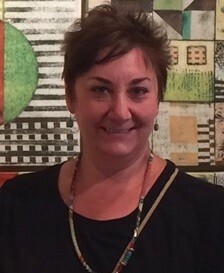 Her artwork has been published in various magazines and books including Ceramics Monthly, Ceramic Arts and Perception, Lark Publications and most recently in Blouin’s Gallery Guide’s article on SOFA Chicago 2015. Her work is in many corporate, museum and private collections. In 2011, she completed an eight-month extended residency at The Museum of Arts and Design in New York. Though she has always considered herself a die-hard New Yorker, she recently relocated to Santa Fe, New Mexico, to live out her dream of being a full-time artist with a home studio. She looks forward to a different pace where her energy can be focused on her work and she can enjoy the surrounding beauty and culture that the area offers. Sheryl has been on the faculties of Greenwich House Pottery in New York, The Art School at Old Church in Demarest, New Jersey, and The West Side Y in New York. Additionally, she has taught numerous workshops at Harvard Ceramics, Kingsborough College, The Clay Art Center in Port Chester, New York, and most recently at the Ghost Ranch in Abiquiu in New Mexico. She is currently creating work for upcoming exhibits and her future plan is to concentrate on sculpture and painting in the inspiring beautify of the Southwest.